You’ve found a collection of 15 incredible leftover pulled pork recipes. That’s right… get those creative pulled pork juices going with these original recipe ideas! Pulled pork is absolutely delicious. There is just no denying that fact. Here’s the thing though… when you make pulled pork it is always difficult to make “just enough” particularly if you are using a pork shoulder. Well, my suggestion is to never make just enough pulled pork. Always make as much as you can so you’ll have leftovers! In my case, I make enough to not only have leftovers but enough to freeze for later. Yes, pulled pork freezes exceptionally well. If you are going to freeze the pork, make sure that you put some of the braising liquid into the container with the pork so it can stay nice and juicy when it is reheated. 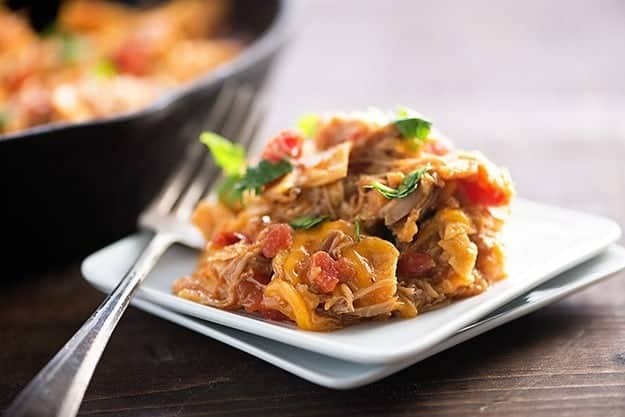 Whether you are using leftover pulled pork or have reheated your frozen stash, you’re going to need some great recipes for inspiration. 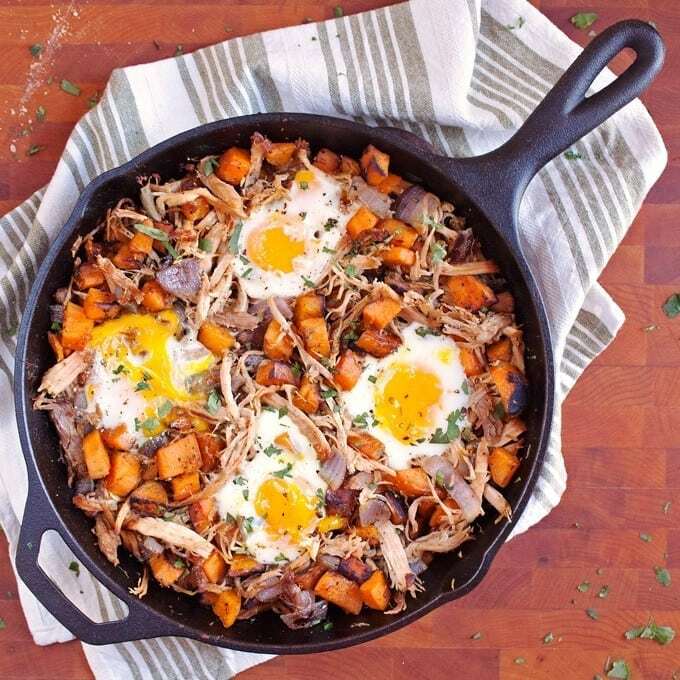 Well, you have found 15 awesome recipes that will put your leftover pulled pork to good use. I hope you enjoy. From Karly at Buns In My Oven. What a cool recipe. It’s got everything you’ll ever need for Mexican deliciousness right in one skillet. Super fast, filling and delightful. From Stacy at Southern Bite. How creative is this recipe? 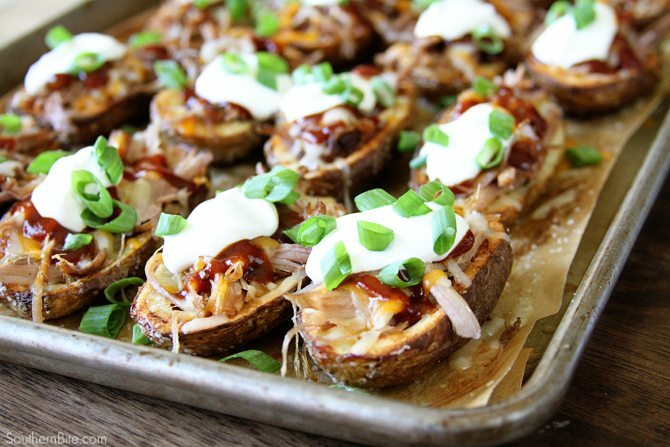 I’ve never thought about using pulled pork in a potato skin. These are loaded up with goodness and sour cream. Yes please. From Scott at I’d Rather Be A Chef. If you are going to make nachos, you might as well go the extra mile and put together this incredible recipe with layer upon layer of flavor madness. From Cade & Carrian at Oh Sweet Basil. Oh how yummy does this look? Although I would have to find a gluten free option, this pulled pork pizza is just making my mouth water. Fantastic. From Nagi at Recipe Tin Eats. There might be no better way to use a frozen batch of pulled pork than in an enchilada recipe. Take a look: it’s saucy, cheesy and loaded with incredible flavors. From Brandy at Nutmeg Nanny. Perhaps the ultimate comfort food… This yummy recipe combines the goodness of homemade mac-n-cheese along with incredibly tasty pulled pork. Add some BBQ sauce to take it over the top. From Scott at I’d Rather Be A Chef. Such a simple recipe that is ready for the table in no-time-flat! Reheat the pulled pork, add toppings and slather in the fiery sauce. From Karen at 2 Teaspoons. I had to include a recipe that could be awesome for breakfast, lunch or dinner. An incredibly versatile dish that is hearty, filling and looks absolutely divine. From Tracey at The Kitchen is my Playground. 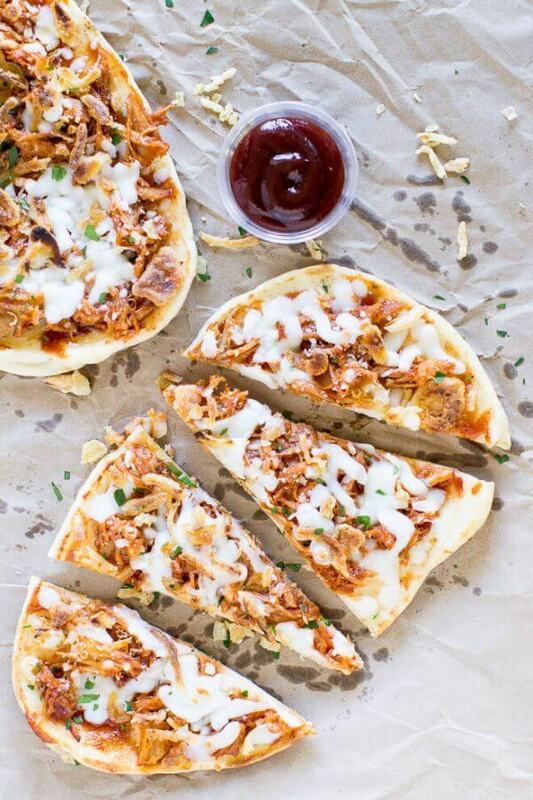 Pulled pork on pizza is so good that I had to include two recipes in this collection. Add sweet and spice into the mix for the ultimate flavor combination. From Jessica at A Happy Food Dance. When I see this chili, I want to do a happy food dance. If I could reach my fork right into the screen to take a bite, I would. Delightful recipe. From Scott at I’d Rather Be A Chef. A healthy soup brimming with hearty vegetables and homemade stock. Perfect for a winter warmer. Freezes extremely well too! From Steve at The Black Peppercorn. What is it about shepherds pie that just looks soul satisfying? Maybe it’s the potatoes… or the corn… or the pulled pork. Whatever it is, Steve makes it all look fantastic. From Marion at Our Life Tastes Good. 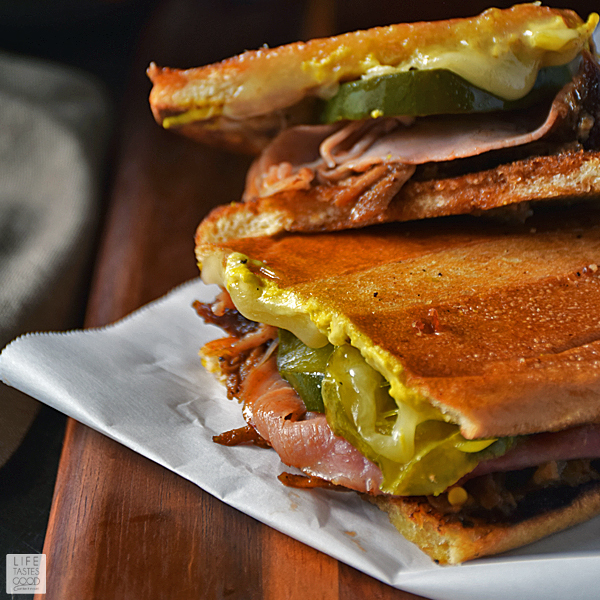 If you’ve never had a good cuban sandwich, this recipe is a great place to start. It’s packed with pulled pork and traditional flavors for a sensory overload. From Trish at Mom On Timeout. 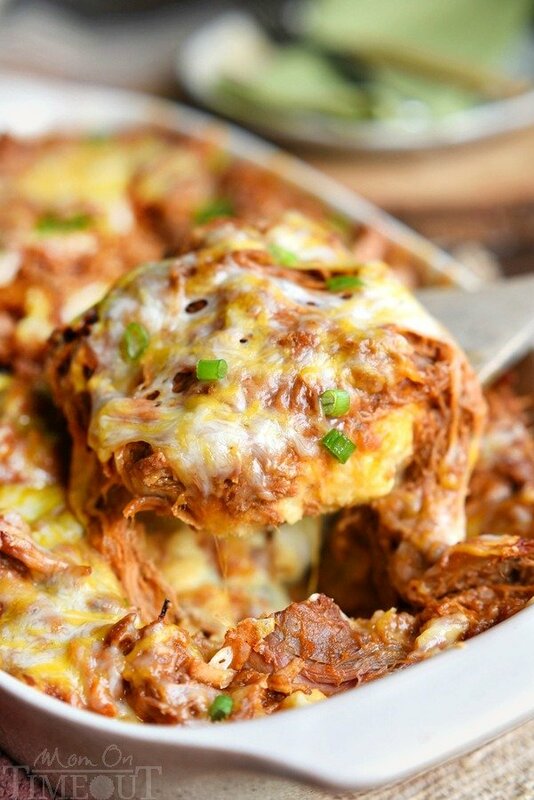 How creative is this pulled pork casserole recipe? The flavor combinations between the pork, bbq, potatoes, cream cheese and BACON are unreal. Delicious. From Mary at Vindulge. I love pulled pork tacos so much that I needed to include two recipes. If you’re a fan of smoke, then this recipe is right up your alley. Top with shredded cabbage, sour cream and BBQ sauce for a nice twist on tradition. « A Broccoli Cheddar Frittata to Love! Hey there! Very cool blog. Love your story of how you found your passion. I currently work in the industry too. But I love blogging more! Thanks for the follow on Twitter! Thank you so much for the compliments, I truly love it when the food that I cook makes people happy. Have an awesome day in the kitchen! These all look so amazing and we are HUGE pork fans so I can’t wait to try each one! Thank you for taking the time to write your thoughts on this. Let me know how the recipes went. What a great round up. I would try every single one of these recipes! For reals! Especially the pulled pork Mac and Cheese. Yum. Which one did you end up making? I’m curious. Thank you for visiting the blog and have a fantastic day in the kitchen! It’s funny – I’ve been working on my own series of recipes using left over Pulled Pork. It’s great to see such a nice collection. I’ll be sure to try out some of the recipes and ideas. Glad to help however I can. Thank you for stopping by and have an excellent day in the kitchen! SO many great ideas here! I love me some pulled pork! I love me some pulled pork too! Going to be making a couple recipes from this post when I get home.